Registration is open for the annual West River Trail Run on Saturday June 4, 2016. Visit The Collaborative website HERE for details, trail map, trail run packet and registration information. Walk or run along the river on the beautiful West River Trail! The run starts at the Londonderry Depot, 34 West River Street, South Londonderry, Vermont and ends at the Jamaica State Park, 48 Salmon Hole Lane, Jamaica, Vermont. New this year is a 5K fun run/walk. Participating in this event will support The Collaborative and help provide fun, healthy educational programs for youth in the Northshire and Mountain communities of Southern Vermont. The West River Trail Run is a spectacular run along the West River from South Londonderry to Jamaica in beautiful Southern Vermont. Open to single runners & relay teams of 3. Hikers and walkers are welcome and will start about an hour before the runners. 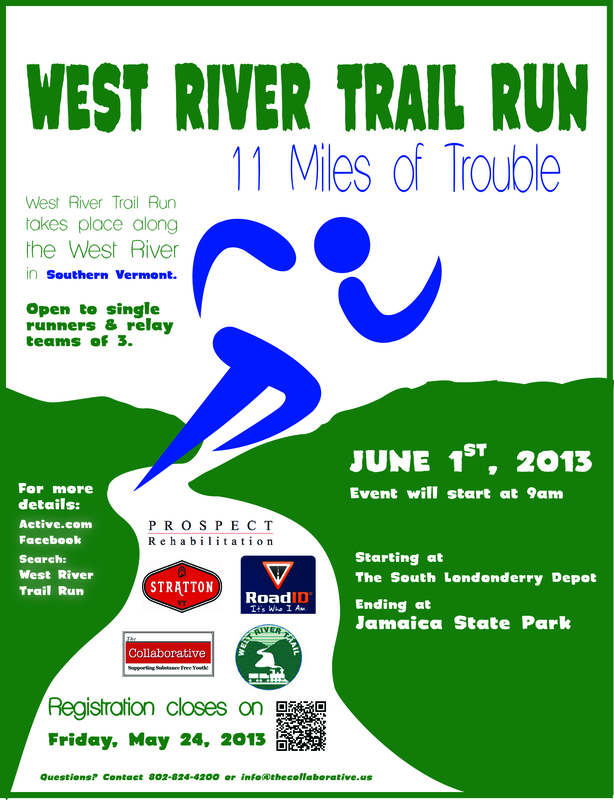 For more information and to register, please call 802-824-4200 or check the The West River Trail Run website. A spectacular run along the West River from South Londonderry to Jamaica in beautiful Southern Vermont. Open to single runners & relay teams of 3. Hikers and walkers are welcome and will start about an hour before the runners. 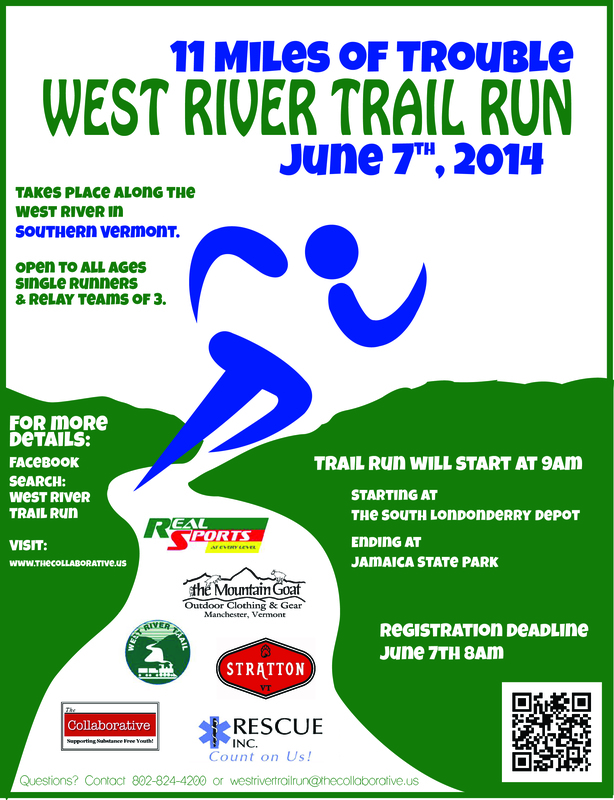 For more information, please call 802-824-4200 or check the The West River Trail Run website. Or follow on Facebook. 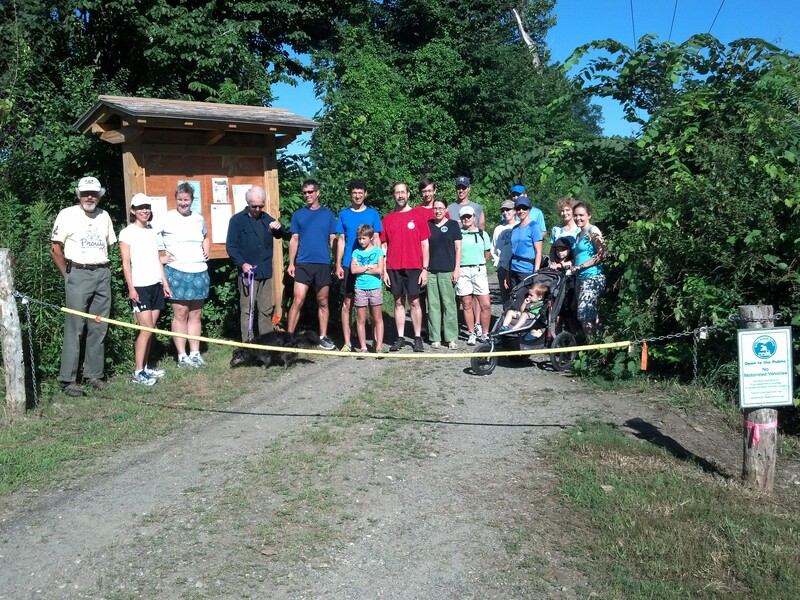 The 1st Annual West River Trail Run held on June 1, 2013 was a huge success! Runners were blessed with spectacular weather and a beautiful trail. A big thanks to the runners, volunteers and spectators, and to our partners – Friends of the West River Trail, Southern Vermont Technical Rescue, Winhall/Townshend Campground and Jamaica State Park. A big thanks also to our sponsors – Stratton Mountain Resort, TimberQuest, Prospect Rehabilitation, Real Sports, Peabody’s Apiaries, Taylor Farm, Maggie’s Farm and Grandma Millers. More pictures can be found on the West River Trail Run Facebook page. Hope to see you again next year! Relay teams of 3 or individuals are invited to participate. Runners have the option to ride the bus from Jamaica State Park back to the start after awards ceremony. Relay teams are allowed one car during the run to transport. Teams are responsible for their own transportation. To register, click HERE. Registration closes on Friday, May 24, 2013. Registrations may be mailed to The Collaborative c/o Trail Run, PO Box 32, South Londonderry, VT 05155.